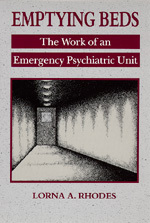 The work of inner-city emergency psychiatric units might best be described as "medicine under siege." Emptying Beds is the result of the author's two-year immersion in one such unit and its work. It is an account of the strategies developed by a staff of psychiatrists, social workers, nurses, and other mental health workers to deal with the dilemmas they face every day. Lorna A. Rhodes is Associate Professor of Anthropology at the University of Washington.